Have you been enjoying the new format? Thank you SO much to the Heathers (lol) Joanna (all the way from the UK) Christie and Teri for their projects! Great job ladies - can't wait to see what you come up with next. I recently bought the new Wild Card II cartridge. Pretty interesting and I made the binder project which was a little too easy if you ask me. I liked that I could do a matching envelope and there are several projects I want to try out on this cartridge. I'm glad I bought it. I also bought the brand new Close to my Heart Cricut Cartridge and it will be here next week. I will be sure to show you that one and maybe do a little video! If you want the new Cartridge Artiste looks like it's going to be as wonderful and as popular as it's sister Art Philosophy. You get the cartridge of course with over 700 images. There are 3d projects, a font, cupcake wrappers, party favors and invites and oh so very much more! I can not wait to get my hands on this! If you wanna take a peak at the binder just click here. There are also 3 EXCLUSIVE stamp sets and 3 chipboard sets. The entire package is $99.00 I realize that is a large sum but if you think about it, it really is quite the bargain. The cartridge in reality would be 30.00. 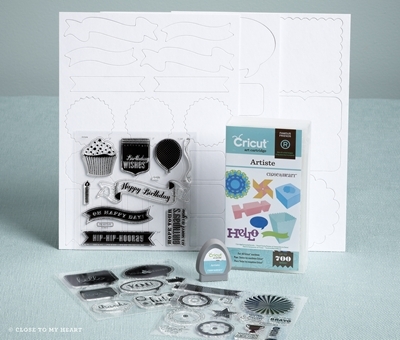 Each stamp set is 17.95 and each of the chipboard sets are 4.95. I sure hope if you are going to purchase this set you would consider getting it from me! You can order it direct from Close to my Heart by shopping here which is my consultant site. You can also click the upper right corner of my page to shop with me. I'll see you tomorrow with another project, then Christie will be up Friday, then the Heathers and possibly Joanna again for the weekend. Thanks everyone, your support means a lot to me! Hmmmm....I dont have that cart yet but will hopefully..Love the card w/matching envelope.Love the Bright colors and the Adorable Owl! !